Tyler Blackwood came off the bench to give Newport County their first win of the season against in-form Carlisle. The Cumbrians are League Two's top scorers but were perhaps fatigued from their League Cup penalty shoot-out loss at Liverpool in midweek. Blackwood had only arrived at Newport on Thursday on an emergency loan from Queen's Park Rangers. But the striker, 24, made an immediate impact on his debut, heading home from a Nathan Ofori-Twumasi cross. Newport County manager Terry Butcher told BBC Wales Sport: "It was a great relief in the end, I think the referee had a calendar not a watch! "But when that final whistle blew it was a lovely feeling because the boys have worked so hard, especially in today's game. "We were under a lot of pressure, Carlisle played well, knocked the ball around well - we've had to put some good blocks in and the goalkeeper [Joe Day] has made some good saves." Match ends, Carlisle United 0, Newport County 1. Second Half ends, Carlisle United 0, Newport County 1. Matt Partridge (Newport County) wins a free kick in the attacking half. Corner, Carlisle United. Conceded by Scott Barrow. Attempt missed. Michael Raynes (Carlisle United) header from the centre of the box is close, but misses to the left. Michael Raynes (Carlisle United) is shown the yellow card for a bad foul. Scott Barrow (Newport County) wins a free kick in the defensive half. Attempt missed. Kevin Osei (Carlisle United) right footed shot from the centre of the box is close, but misses to the left. Substitution, Newport County. Matt Taylor replaces Janoi Donacien because of an injury. Attempt missed. Derek Asamoah (Carlisle United) right footed shot from the centre of the box is close, but misses to the right. Bastien Héry (Carlisle United) wins a free kick in the defensive half. Joe Day (Newport County) wins a free kick in the defensive half. Foul by Derek Asamoah (Carlisle United). Attempt saved. Michael Raynes (Carlisle United) header from the centre of the box is saved in the centre of the goal. Corner, Carlisle United. Conceded by Seth Nana Ofori-Twumasi. Attempt missed. Alex Gilliead (Carlisle United) right footed shot from outside the box is just a bit too high. Attempt saved. Lenell John-Lewis (Newport County) right footed shot from the right side of the box is saved in the centre of the goal. Kevin Osei (Carlisle United) wins a free kick on the right wing. Attempt blocked. Alex Gilliead (Carlisle United) left footed shot from the centre of the box is blocked. Attempt missed. Troy Archibald-Henville (Carlisle United) header from very close range is just a bit too high following a set piece situation. Corner, Carlisle United. Conceded by Lenell John-Lewis. Scott Boden (Newport County) wins a free kick in the defensive half. Substitution, Carlisle United. Kevin Osei replaces Joe Thompson. Substitution, Carlisle United. Alex McQueen replaces Angelo Balanta. Goal! Carlisle United 0, Newport County 1. Tyler Blackwood (Newport County) header from very close range to the high centre of the goal. Assisted by Lenell John-Lewis. Attempt missed. Tom Owen-Evans (Newport County) right footed shot from outside the box is close, but misses to the left. Attempt blocked. 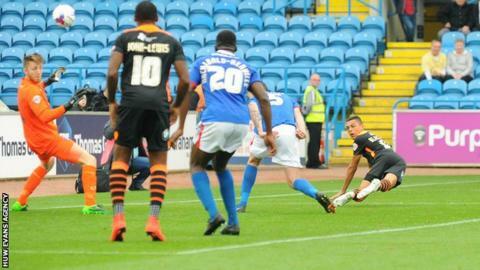 Joe Thompson (Carlisle United) right footed shot from outside the box is blocked. Substitution, Newport County. Tyler Blackwood replaces Aaron Collins. Attempt missed. Michael Raynes (Carlisle United) header from the left side of the box is just a bit too high following a corner. Corner, Carlisle United. Conceded by Mark Byrne.